Il ya deux locations disponibles, l''Zin »et la« Petite Syrah. Ces locations de charme sont accueillants et relaxant. Le 'Zin' dispose d'une cuisine complète et salle à manger, salon avec un canapé en coupe, coin lecture, un bureau et la chambre à coucher avec un matelas coussiné pour terminer votre journée avec une bonne nuit de sommeil. Asseyez-vous sur le pateo dalle pour votre salle à manger ou profiter du bain à remous, pendant que vous prenez dans les vues sur les vignobles et les Oaks patrimoine. La «Petite Syrah 'est dans le un bâtiment séparé. Nommé pour sa petite taille, la Petite Syrah propose un charme de lot et la vie privée pour cette belle propriété de pays du vin. Il ya une cuisine complète combinée avec la salle de séjour, une chambre séparée et salle de bains. Mots-clés: une chambre spacieuse attachés unité dans la loi. Pour les clients supplémentaires, il ya un gonflage des matelas reine de soi dans le Zin et un futon en cuir dans la Petite Syrah. Des frais supplémentaires sont applicables pour les personnes supplémentaires. We stayed in Zin. Plenty of room for 2, liked the nice size kitchen and outdoor grill. Didn't get to the hot tub but looked very clean and well kept. It's not over the top resort style but more of a nice country feel. 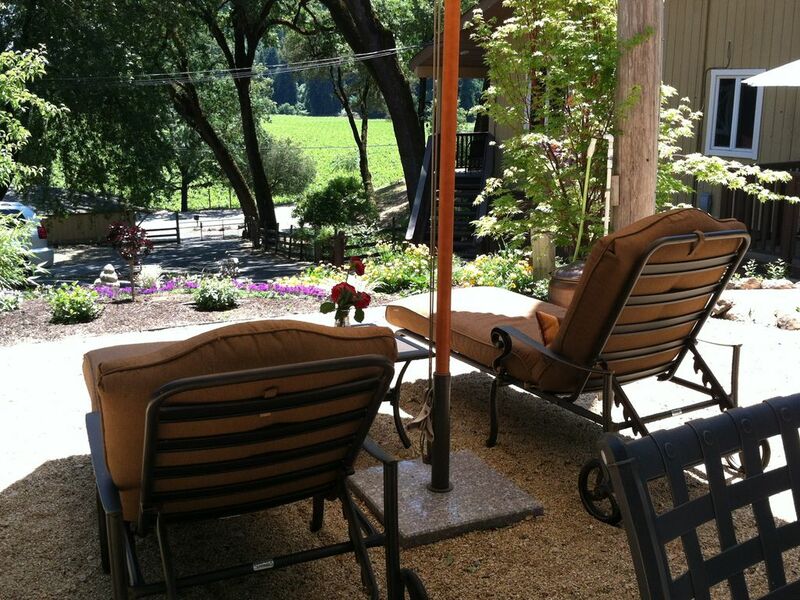 The real draw is the location within Russian River wine country. Easy walk to 3 great wineries, very short drive to many more. Easy access to Healdsburg and Forestville if you don't want to cook. Place was very clean and owner was very friendly. Highly recommend! While our trip was short, we thoroughly enjoyed our time here. The gardens surrounding the house are beautiful, and the home was cozy. Plus the host is incredibly kind and inviting. Loved it! Excellent choice for a quiet getaway that’s within 15 minutes of all the amenities. Great location! Only a 15 minute drive to nearby towns to the east (Windsor and Healdsburg), and a beautiful 45 minute drive west to the Pacific Ocean at Jenner. The property itself is beautifully maintained with a garden setting and a fantastic view of the winery across the street. Highly recommend taking a stroll in the vineyard during the sunset. The property is also very quiet and tranquil. Our overall experience was AMAZING! This property felt as if we were in our own home. Clean & comfortable, the owner was in constant communication with us prior to and during our stay. We will definitely be visiting again!! It was lovely staying at this location so close to the river and with outdoor barbeque and hot tub. Super relaxing. Hosts left fresh cut flowers - love the touch! We had a wonderful stay with Cherie back in late July, where to begin! We received a warm welcome and met her 3 adorable Australian shepherds. The location is perfect to access different wine areas in the region, however it's very peaceful, Cherie has gorgeous gardens and there is a private vineyard across the road. The suite was very comfortable, had everything we needed. We enjoyed the outdoor area and had a dip in the hot tub. Cherie has secret suggestions, great tips for the local wineries and also leaves some wine tasting passes out. Cherie also left us a yummy Rose wine and some fresh veg from her amazing garden! You will have your privacy, but Cherie is also around if you need her. Fantastic stay, we'd definitely stay here again. Thanks Cherie, Bec & Mike. Situé dans le cœur de la Russian River Valley, renommée pour d'excellentes pistes cyclables et premiers vignobles. Please note, rates shown are the standard rates, $175 for the Petite Syrah and $225 for the Zin. Rates are subject to change for holidays and event dates. Rental agreement must be signed and returned to Owner to complete reservation. Thank you for your interest in Terra Bella.